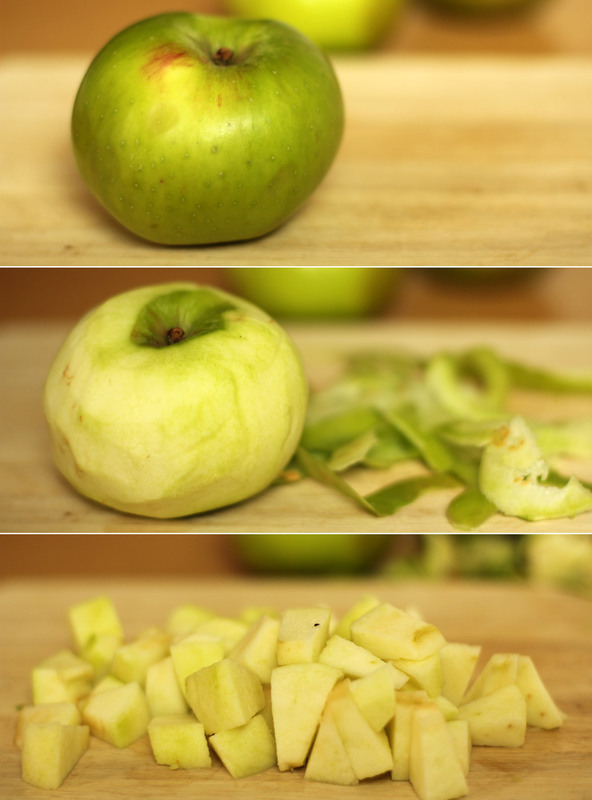 When it comes to autumn blogging, I just can’t get away from apple related ideas. It’s a well known fact that toffee flavours go well with apple so I thought I might wheel out the salted caramel recipe for this week’s post. We had this after a large roast on Sunday and it was the perfect pud for a cosy autumn afternoon. 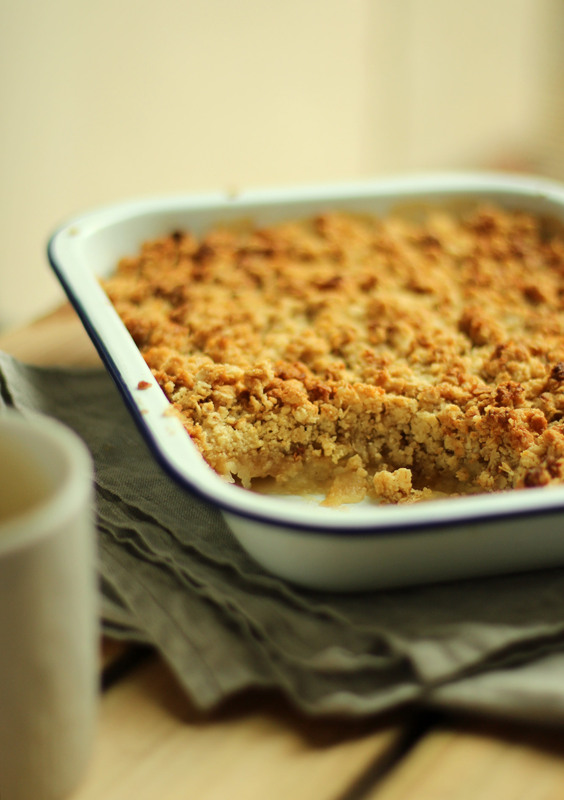 One of my housemates (self proclaimed crumble connoisseur) called it “the zenith of desserts”, just saying, perhaps this crumble is not so humble after all. 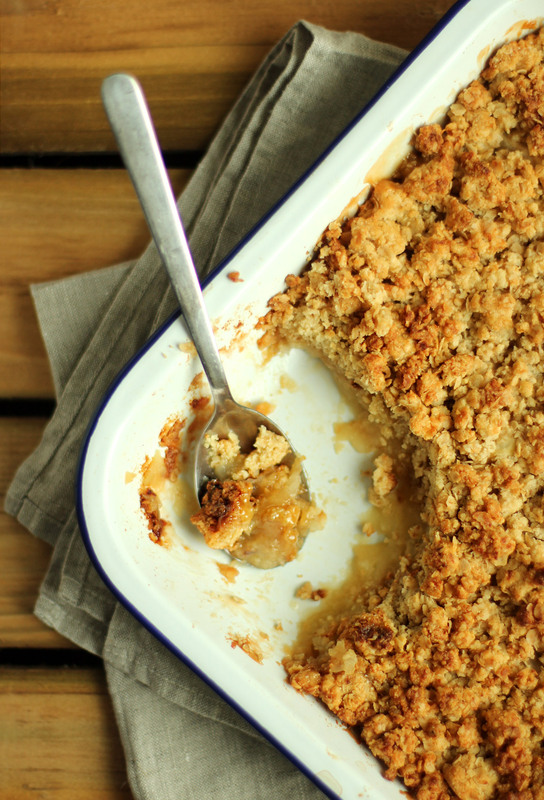 The great thing about crumble is that it’s so quick to make and you can do it in advance, either cooked or uncooked and pop it in the fridge until you need it. Apologies to those of you who spotted the missing ingredients list for a while there! 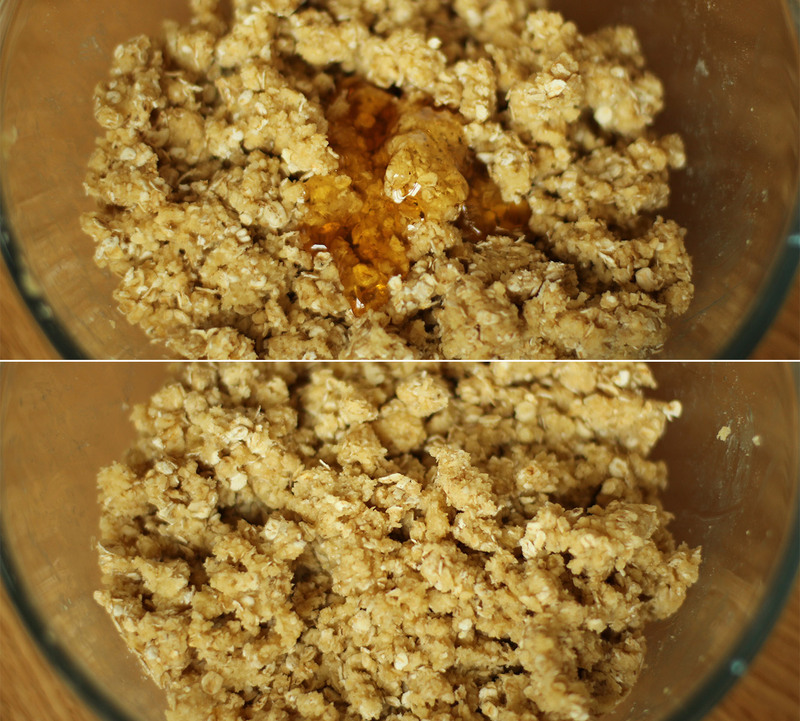 Mix together the dry ingredients for the crumble topping (almonds, flour, oats and sugar). Rub in the butter with your hands, it’s better if it’s cold as the mix will breadcrumb a bit more. Mine was a little on the soft side because I got distracted and left it on the counter for a while. Add the honey and mix in with a wooden spoon. Put it in the fridge until needed. Place all the ingredients for the salted caramel into a saucepan (minus the cream). 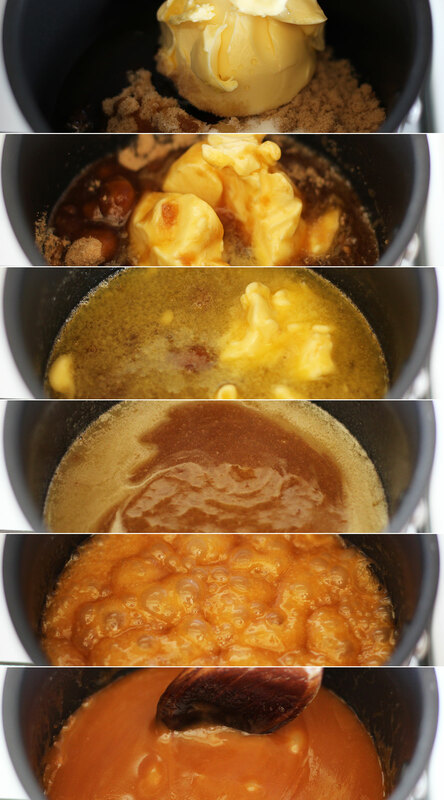 Heat gently until the butter is melted and the sugar dissolved and then bring to a simmer. Simmer for about 10 minutes. Stir regularly so that it doesn’t catch and burn. Leave to cool for fifteen minutes to half an hour. 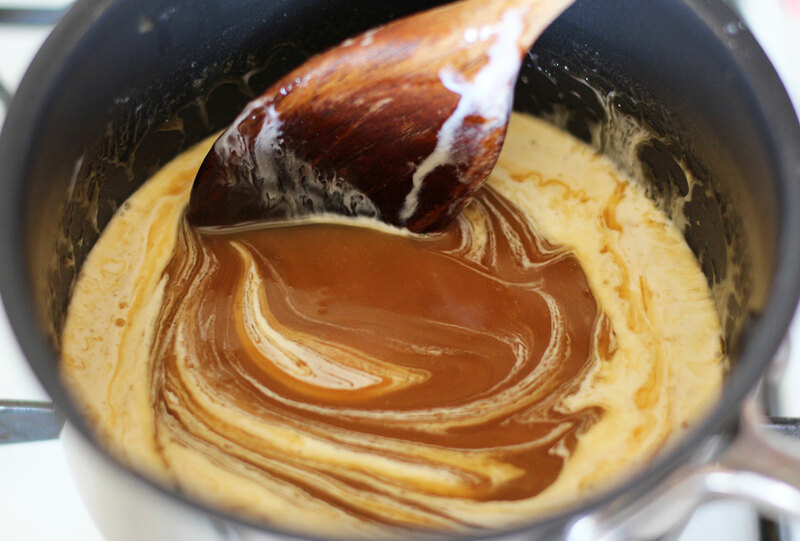 Once the caramel has cooled for a little while add the cream and stir until combined. 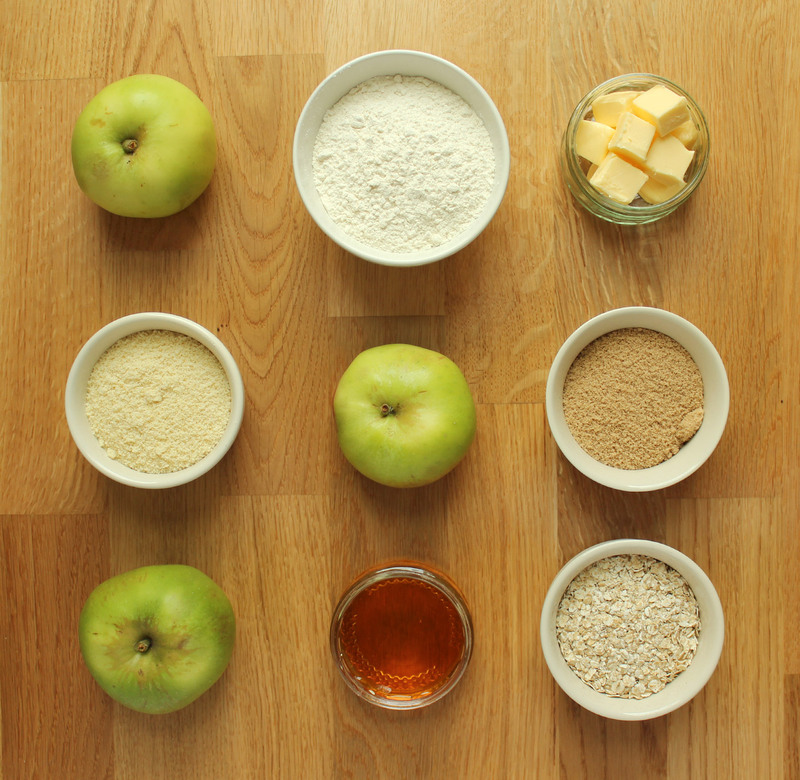 Put the apples in the bottom of your dish, sprinkle with a little light brown sugar. 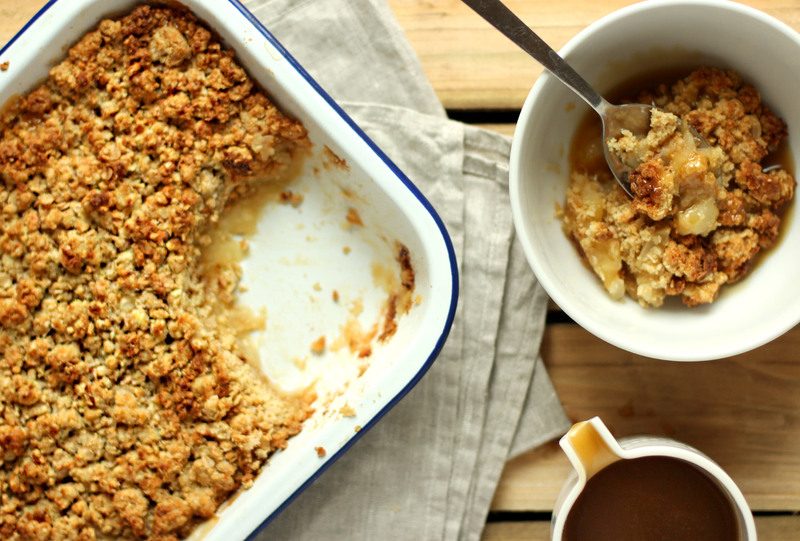 Pour just a third to a half of the caramel sauce over the apples and cover with the crumble mixture. Bake with on 180C/350F/gas mark 4 for 40 minutes. Boom. The zenith of desserts.